Above: Robin Hood draws his Welsh longbow in "Wolfshead" (1969). Robin Hood would have used at least two different bows. One simply for hunting game in Sherwood Forest, and one powerful enough to penetrate armour when confronted by the Sheriff of Nottingham's or Prince John's soldiers and constabulary. And to do the latter he would have used one of the the most powerful weapons of medieval times: The Longbow. 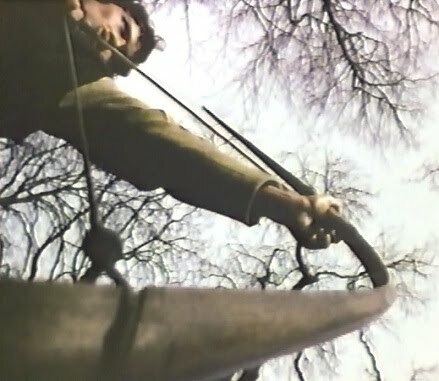 The Longbow originated in Wales, a fact alluded to in the movie "Wolfshead" (1969). The Welsh used it to fight off attacks from the English before the end of the 11th century. The English recognised its awesome power and soon adopted it as their weapon of choice, so contrary to some people's belief, the Longbow was around at the time of Robin Hood albeit perhaps not yet fully established in the English army. As the decades passed it became known as the English longbow. Knights had no protection against the arrows of the longbow, which could pierce their armour more than 250 yards away. For example, at the Battle of Crecy (1364), the French lost 2000 Knights and soldiers, compared with only 50 English fatalities! In the military, a longbow was made to measure, depending on the individual archer's height, and it is interesting to speculate whether or not Robin Hood might have received some military training. The English longbow would normally have been made of Yew, whereas the Welsh preferred Elm. It would have been protected by wax or resin, and the string made of hemp soaked in glue. Longbow arrows were about 3 feet long and came in a various types according to whether one wanted to bring down a horse, pierce chain mail or armour plate. So powerful was the bow that skeletons of longbow archers are often found deformed, with enlarged left arms and bone spurs on their left wrists, left shoulders and right fingers. A skilled military archer would have been capable of firing 12 arrows per minute, and we can be sure Robin Hood would have matched that. However, whereas a military archer's arrow was one small part of a huge volley, Robin Hood's reputation is that of an expert individual marksman. According to legend the Yew for Robin Hood's bow came from a Papplewick churchyard, and it is worth noting that such trees were well known for their medicinal, symbolic and spiritual qualities. For more pictures of Robin Hood and his bow click on THIS LINK, and THIS LINK. Did you know? The English Archery Law of the 13th century ordered that all Englishmen between the ages of 15 to 60 years old must equip themselves with a bow and arrows. King Edward 3rd further commanded obligatory archery practise on Sundays. This Archery Law "forbade, on pain of death, all sport that took up time better spent on war training especially archery practise". King Henry 1st later proclaimed that an archer would be absolved of murder if he killed a man during archery practise. So if you're reading this in the UK, get practising!